Turning a wooden baseball bat is a great first project for the lathe as it is relatively easy one once you get started and should also be a great source of fun and accomplishment once you have finished. Following this instructable will take you step by step on how to make the baseball bat from the chunk of wood you start with to a beautiful piece of work that you could treat as art or even play around with. Note: This is my first instructable I have ever posted so sorry if I leave a small step out or say anything that could possibly be unclear. I'd love to answer your questions to the best of my ability in the comment section below if any arise. Also if you guys enjoyed this or thought it was helpful I'd really appreciate it if you'd vote for me in the contests I've entered. Baseball bat billet - Pick a billet that is at least 4" longer than what you want the end bat length to be. These can be picked up online or at a more specialized woodworking stores such as woodcraft if you have one near you. To complete this project you should have some basic knowledge of how to safely operate your lathe and use the tools. If you have 0 experience and still want to pursue this project I recommend that you look up some videos on basic knowledge of lathe operation or ask someone you might know that has experience. Note: Make sure you are wearing proper protection and clothing when operating the lathe at all times. This includes no clothing that can possibly dangle and get caught in the lathe while it is spinning and also proper eye protection and in the best of situations a face mask and dust mask to prevent inhalation of any small particles that are produced. When choosing your billet you first have to decide what species of wood you want to use. Generally most store bought billets I have ever found are going to be hard maple or ash and either of these will work perfectly for this. Your want to pick a billet that is roughly 3" in diameter and 4" longer than the length of the bat you want at the end of the process to allow for cutoffs to be made. To maximize the strength of the bat you want to find a billet that has straightest grain possible along with no knots in the wood. Before mounting your billet to the lathe you have to prepare the the billet so that it accepts the spur center securely and also clear it of any stickers or harsh edges that could catch your tool when turning. First, you need to find the center point of both ends of the billet and then mark it with a pencil. In the pictures I show myself using the center finder to do so but you can do this by any means as long as it is the center most point. Once the centers are marked, you take your awl and rubber mallet and drive a pilot hole into both center points of the wood for your lathe centers to grip into to. Now choose one side of the billet to be the side that the spur center will dig into. Now take your handsaw and make one cut through the center point just enough so that the spur can grasp the edge when sitting inside the cut. Repeat this process but turn the billet so that the next cut is perpendicular to the previous one made. Once both cuts are made, align your spur center as straight as you can in the wood and then give it a couple of taps with your rubber mallet to make sure it catches those edges. Finally you are going to want to look for any flaws in the wood, do so by hand and sight. Lightly sand out any flaws with a low grit sand paper such as 100 grit. Note: Make sure you do these steps properly as if not done so the wood could possibly catch on the tool or fly off the lathe where it might hit you which would be no fun for anyone. Now with the spur center able to grasp the billet you are going to want to mount your billet to your lathe. For my bat I positioned it so that the barrel is closest to the tailstock of the lathe but this does not affect the outcome of the bat, it just may be easier to follow the instructable if placed at the tailstock since I do so. The first thing you will want to do when marking up your billet is to mark 2" of each end to allow for cutoffs to be made after turning is completed. After this you will want to mark the rest of the billet into 3" sections. If the length of the bat is not evenly divisible by 3" intervals, mark 3" sections until it is no longer possible and then mark the left over 1"-2" as single inches as I showed in the diagram. It may also be helpful to mark a smaller 0.8"-1" section inside of your first 3" section to designate where the handle end will go. The width of this end should just vary by your preferences as some people may prefer a bit wider handle end than others. To make turning the bat easier once you get started, you will want to cut into the billet at the premarked 3" lines the depth that you want at that section. The diagram I provided above are the measurements that I have found to work best and I would recommend referring to those; but you could copy your own from a already owned bat or freehand it by sight, though I highly suggest you don't try to do this unless you are fairly experienced in turning as it is quite easy to mess up leaving you with a very odd looking bat. Once you have decided on which measurements you are going to use you will want to grab your parting tool and calipers. Begin cutting into the billet at the section lines you made but make sure you carefully check the diameter inside the cut with your calipers every so often until you get that section line cut to the corresponding diameter. Repeat this for all of the lines until the entire billet is cut. On the 1" sections at the end of the barrel, that you may have marked, you should continue cutting the diameter of these to what the diameter of the last cut was. If following my measurements then these would be cut to a 2.5" diameter. Note: When making these cuts you will want to leave a little bit of extra wood on the diameter, so add any where from 1/16th to 1/8th to the diameter for cutting. This should be a safe amount of room for possible error as well as sanding later. Now that everything has been prepped and is ready to go you can start shaping out the bat. To do this you are going to want to start out with your roughing gouge and begin cutting away material. With your roughing gouge alone you should be able to remove nearly all of the waste material. Once your guide marks are almost no longer visible due to shaping the billet, you can begin taking out your other tools (in my case round nose scrapers) to make finer cuts that will smooth out the surface of the bat and make sanding easier. Note: During this process, especially when you get to the ends of the bat, you may find it necessary to trim down the diameter of the cutoffs. This is perfectly fine as long as you keep them thick enough to support the bat efficiently. If cut to thin the entire bat could become very unsupported and start vibrating causing you to damage the bat with the cuts you make. 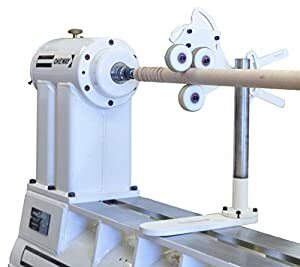 If you are not 100% confident with just leaving the cutoffs thick enough to support the bat you can buy a support for your lathe such as this, which will stabilize it greatly. The woodworker's favorite past time, ahh yes sanding! Now that you have successfully shaped your billet into the shape of a bat you are going to need to sand the bat to produce that smooth to the touch feeling. Of course though this is your own preference on how smooth you would like your bat to be, but either way some sanding is a must. I take my bats through the process of 100 grit, 150 grit, 220 grit or 240 grit depending on what I have on hand, 320 grit, 400 grit, and 600 grit only moving up a grit level until I feel the entire bat is completely sanded evenly with the current grit. If you plan on playing with this bat I would not waste your time sanding with a sandpaper higher than 220 grit as it is going to get beat up some just from use and you might as well save yourself the trouble. Note: The bat should still be on the lathe at this point as sanding while the bat is not spinning is not going to be effective as it will not be even. When finishing the bat I generally like to use straight mineral oil, llinseed oil, or tung oil as it really brings out the grain in the wood and I love that look, but almost any finish you may have lying around will work for this application. You can apply this to the bat as it spins with a soft rag covered in the finish. Also I would recommend at least 2-3 coats of finish on the bat. To do this you are going to want to take your parting tool or any other small lathe tool you have and trim the cutoffs down to the smallest diameter possible without the bat becoming too unstable and flying off the lathe. Once done, you can take the bat off the lathe and cut through the remaining cutoff very easily with a small handsaw. Remember to do this for both ends of the bat. Sand both of these ends as you did to the rest of the bat and then apply finish by hand with a rag. If you want to engrave the barrel of the bat you can do with a wood burner or even a cnc machine if you have access to one. I have never done this with cnc machine so I have no experience there but I have used a wood burner before. If you are using a wood burner start by lightly sketching your design with a pencil on the bat then go ahead and engrave it. Once done engraving, lightly sand the engraved area with the highest grit sandpaper you used earlier and then reapply finish again. Note: If you choose to wood burn the barrel then make sure you practice doing so on a scrap piece of wood as you only get one shot on the real bat. You're now finished with your bat and have a fully functional bat that you can choose to showcase or go out and play with. Thanks for reading the instructable. Hoped you enjoyed!